Home » Pet Tales » Congratulations “Spanky”!! 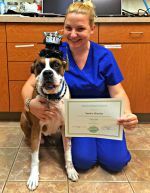 “Spanky” celebrated both the remission of his lymphoma and his “Graduation” (completion of his chemotherapy protocol) last week. 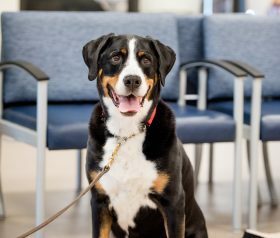 He was diagnosed with lymphoma in March 2015 and has been visiting UVS for chemotherapy treatments. He will celebrate his 10th birthday this week too! Congratulations, “Spanky” and Happy Birthday!